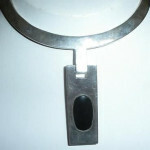 This is a gorgeous heavy handmade 950 Mexican Silver collar necklace with a long onyx center drop. Made of 950 quality silver from Taxco – better than 925. It is marked Alicia, Mexico, CDC, 950, TD-27. 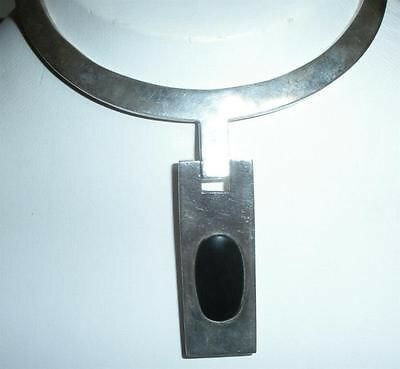 This is a well made necklace with hinged sides, a strong locking clasp and a 2 1/4″ long carved onyx drop in the center. Weight is heavy at 131.2 grams. Condition is excellent. No dents or tears to the sterling. It has beautiful modernist design, fine quality workmanship and excellent hand crafting. All in thick heavy 950 silver this is a stunning statement necklace for your jewelry collection. 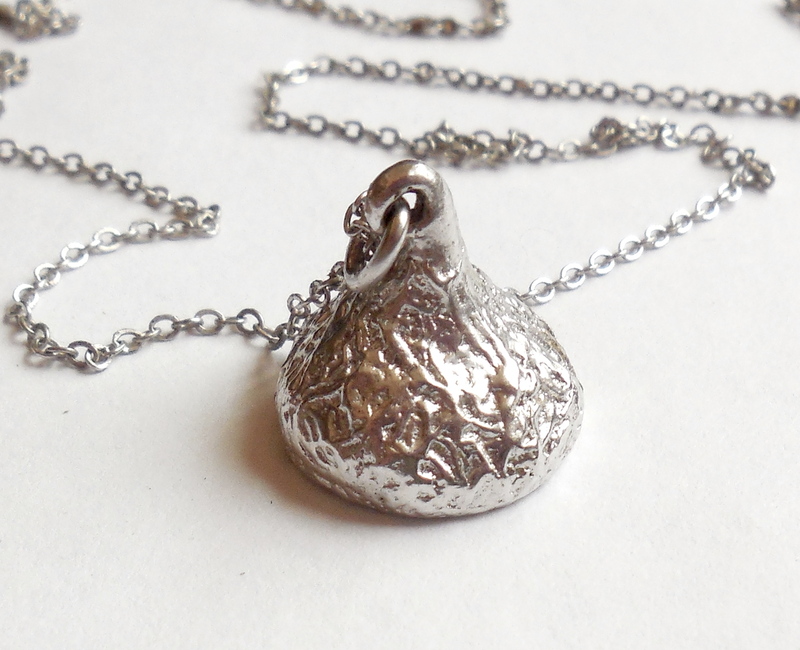 Sterling Silver Chocolate Kiss Necklace Discontinued Type: Dangle Pendant Necklace Metal: Sterling Silver, Both chain and pendant are marked sterling and ster respectively, older marks Size: 24 3/4" Chain is 24" long and pendant is 3/4" tall Weight: 13.9 grams Condition: Excellent, No damage or repair. 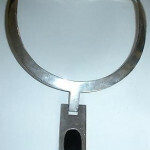 This one is made from one solid chunk of sterling silver. Newer versions are smaller and lighter weight. This is a gorgeous, large, showy, sterling silver collar necklace with 12m beads. It is very well made and strung on thick sterling silver wire with a large lobster clasp. Marked 925 and Guaranteed to be solid sterling silver.....not plated. Size is 16 1/2" long. Each bead is 12mm or just about 1/2" wide. Weight is heavy at 68.3 grams. Condition is better than excellent. No dents or dings. No gauges or tears. Clasp is strong. Beads are better quality, one solid piece of sterling per bead. No half beads pieced together. It is still quite clean. 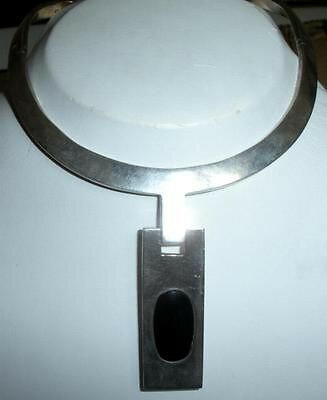 Add a large dangle or enhancer and you will have an absolutely stunning vintage statement collar necklace. 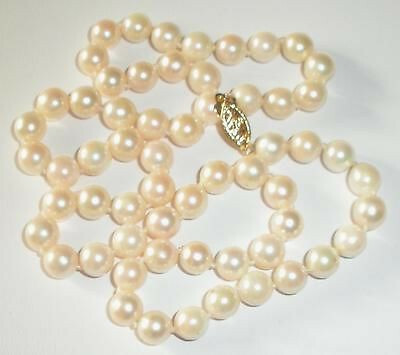 This is a Vintage 14K Gold 6m Cultured Pearls Necklace 18inch size. From an estate and in excellent condition. Please view the photos and read the product description below for further information. 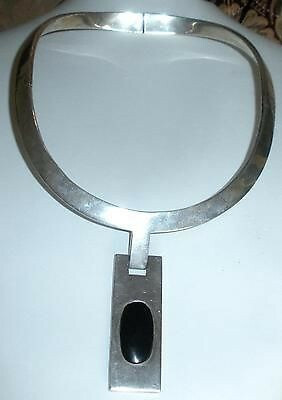 Gorgeous Heavy Michael Dawkins sterling silver Pendant Toggle Necklace! Please see photos and read product description below for further details! This one is a beauty! !